Today finds me in Nanyuki, Kenya at WordCamp Kenya 2013. The past couple years, I’ve been traveling during the event, but this year I get to come hang out with my blogging brothers and sisters. The best bloggers are storytellers, they take you on a journey. They tell you why you should care about things, they’re opinionated and informative, and they understand what makes things interesting to their readers. 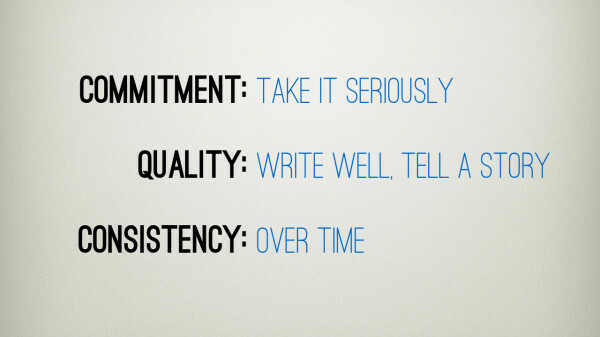 Commitment: to be a really good blogger, you have to commit to it for a long time. Success doesn’t happen over night, and if you take it seriously and really put your mind to it, you can leverage that for much greater things in the years ahead. 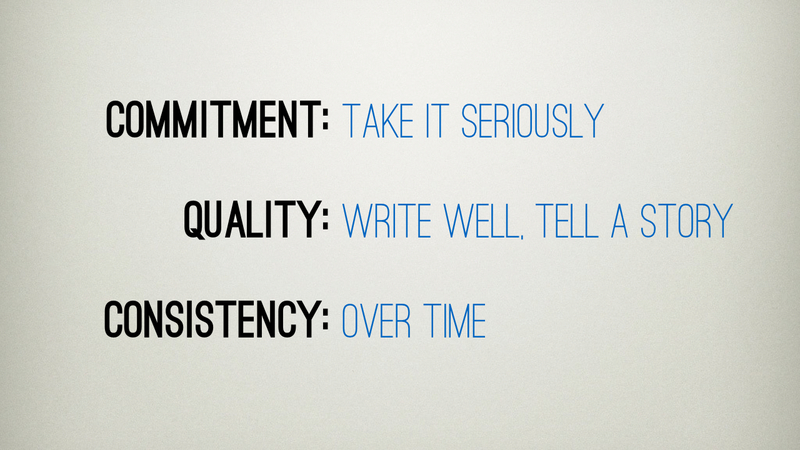 Quality: take the time to write well. Sometimes I’ll write a 4 paragraph blog post and it’ll take me more than 2 hours. That sounds ludicrous, but it’s because I’m trying to find the right phrase, link to the right places and put the right images in that make this worth someone’s time to read. Consistency: this is where I’ve been falling down over the last year or so. If you consistently publish quality blog posts, you’ll gather a following and generate a community around what you do. I blogged consistently, 3-4 times per week for two years before I really got noticed. It’s important to remember that blogging is a long-game, and that if you stick with it, it will pay off. 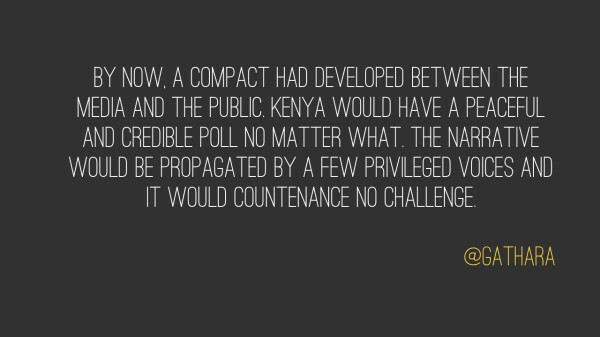 Back in March of this year we had the prolonged (5-day) Kenyan elections, where there was a lot of tension. Where I believe we traded “peace” for truth. I wasn’t surprised that the media didn’t do their job. I was surprised that there were so few bloggers who did theirs. I took a lot of heat for creating the IEBC Tech Kenya blog on Tumblr to track the facts around the IEBC technology failures, but I kept wondering where the other bloggers were. One person who did blog was @Gathara, and boy did he blog well! Our job as bloggers is to be independent voices, and we’re most powerful when mainstream media isn’t doing their job. When we do this blogging in a timely manner and get that information out there quickly and in a well-researched and circumspect way. We need to get back to our Kenyan blogging roots, which were just like this back 4-7 years ago. Making money off of blogging is fine, nothing wrong with that. I’m tired of cut and paste blogging though, where people take press releases from a corporate and get paid to just paste it with no changes. I want to know why what that company is doing is interesting, why I should care. I want to know what your opinion is. Don’t sell out and lose your identity. I see articles on the East African, the Telegraph, the Nation, but only a couple blogs show up in Google search results. Why? Already we have loose set of laws around media and information, it’s a slippery censorship slope that hurts all but the powerful in Kenya. This new law makes it even worse, it smacks of Moi-era censorship. Where are the bloggers using this opportunity to push back? Don’t we realize that this law applies to us too? My final discussion points were about how even if you have very little, you can still use WordPress, Twitter and Instagram to build a brand. I talked briefly about where we’d come from with Ushahidi and the iHub, just using blogging and social media to get on the map. Now, we’re doing the same thing for BRCK. I used the example and ran through the story of the BRCK expedition to Lake Turkana to catch the Solar Eclipse. 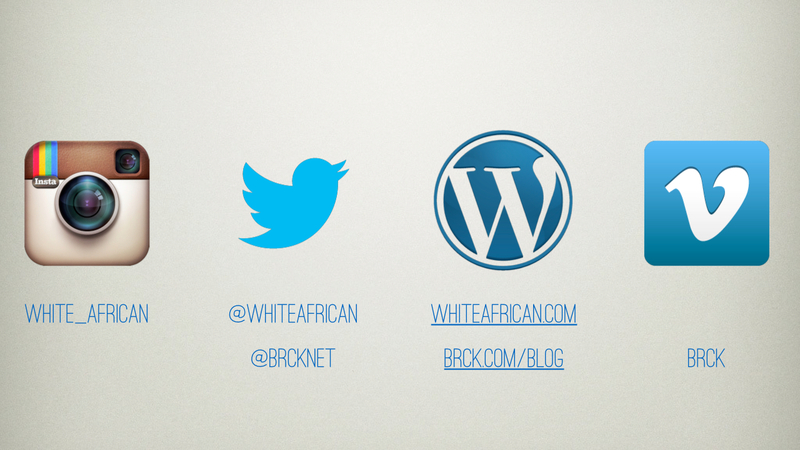 I used my blog, as well as the BRCK blog to create the narrative, amplified by Instagram, Twitter and Vimeo. When you’re building a new brand, what you write and the images you use, help people understand what the narrative and brand is about. 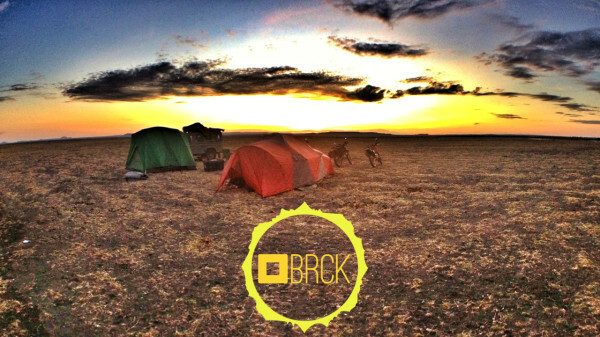 For us, it was important to put a stake in the sand (literally too, I guess), about the BRCK being a rugged connectivity device. Nothing said that quite like the team behind it out and thrashing it themselves (and also thrashing themselves…). The results of this were that by the time we got back a week later, there were many more people interested in buying a BRCK themselves, but also people who now wanted to partner with us and even invest. Blogging is a long-term strategy. The Ushahidi blog has been a big part of our identity for almost 6 years. 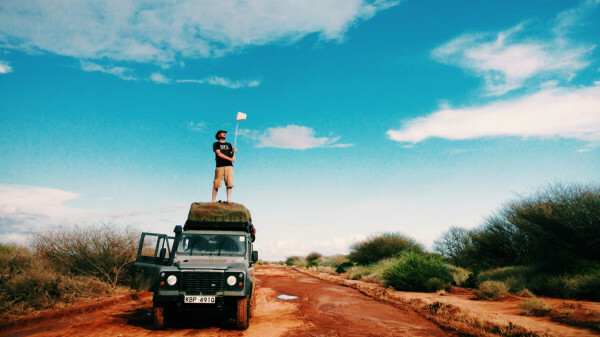 The team who built Ushahidi were all bloggers, so it makes sense that it’s part of our DNA. For the iHub the same. For BRCK the same. I don’t believe in press releases, I believe in blogging the story and if you’re doing interesting things and telling the story about them well, then the right parties will find you.